Side by side, City Theatre has two productions each featuring one man standing on a stage talking directly to audiences about memories. The Wonder Bread Years, a simple, nostalgic entertainment, has fun with bygone cultural innocence. Meanwhile, next door, Anthony Rapp reminisces about a time when he too was innocent, probing something significant: dealing with death. 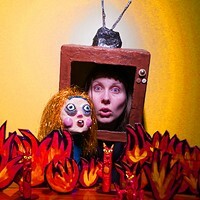 While both productions remain theatrically limited, Rapp's Without You comes across as a serious alternative to the fluffiness of The Wonder Bread Years. Rapp spends much of an hour-and-a-half performing rock songs and revealing backstage details about Jonathan Larson's Broadway hit Rent and his leading role in it. 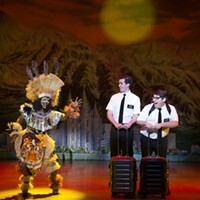 But don't think of this world-premiere show as self-promotion, because, gradually, Rapp explores and subtly connects Larson's subject to his mother's impending death and their relationship, as well as Larson's sudden demise. His choices of Larson's songs and others clearly dovetail with what he wants to say about dying, pointing out that Rent, confronting the devastations of AIDS, nonetheless affirmed life. Rapp portrays his earlier self as emotionally contained until he finally realizes how much he loved his mother. Along the way he also personifies her, other family members, Larson and others, simply, sweetly, gently, without much acting depth. Perhaps he's trying to tell us that we are all alike. Certainly, Without You, directed by Steven Maler, contains implicit messages. For example, in intermittent connections between mother and son, they sign off with a ritual "I love you." Only when his mother lies dying, Rapp indicates, did he realize the meaning of those words. Since he talks more about events and conversations than about feelings, he never makes explicit the universality of what he went through, and does not make it easy to connect with his ultimate grief, or with him. When he sings, though, backed by a sturdy, pulsing instrumental quartet, he lets himself go, almost howling, bending his frame as if in pain, suggesting, perhaps, that that is safe territory for emotional outlet. The meaning and the strength of the songs (by Larson, Rapp and others) lie in what the lyrics say and how they say it. Though they throb with dynamic rhythm, they offer almost nothing melodically. Clearly Rapp, like Larson, wants to tell us something important. Larson did so via a detailed story, a large cast, sets and costumes. Call that "theater." 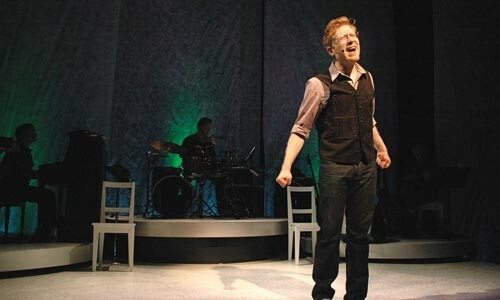 Rapp it up: Anthony Rapp in Without You at City Theatre.